Yossi Milo Gallery is pleased to present an exhibition of photographs by Ezra Stoller (American, 1915-2004). 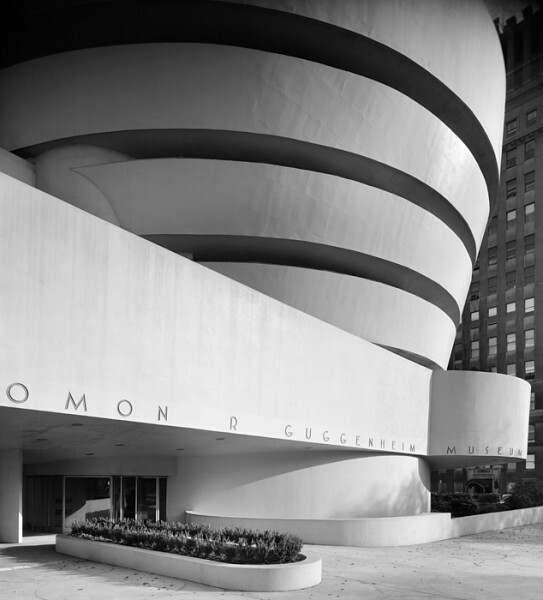 Ezra Stoller Photographs Frank Lloyd Wright Architecture is presented in celebration of the 150th anniversary of Wright’s birth and highlights key photographs by Stoller of the architect’s important buildings. The commemorative exhibition will open on Thursday, June 29 with an opening reception from 6:00 – 8:00 PM, and will be on view through Friday, August 25. During his career as an architectural photographer from the late 1930s to the 1970s, Stoller worked closely with Frank Lloyd Wright, in addition to many other leading architects of the period, such as Paul Rudolph, Eero Saarinen, I.M. Pei, Marcel Breuer, Le Corbusier and Gordon Bunshaft of Skidmore, Owings & Merrill. Stoller’s connection to Wright began in 1945 with the photographs of Wright’s Taliesin in Spring Green, Wisconsin and Taliesin West in Scottsdale, Arizona, which were widely published and shown at the Museum of Modern Art in 1947. Stoller subsequently photographed many other Wright buildings, including the Guggenheim Museum, Fallingwater, the Marin County Civic Center, and the SC Johnson Research Tower, examples of which will be among the 20 gelatin silver prints on view in the exhibition. Stoller spoke of the difficulty of capturing the Johnson Research Tower’s opaque quality while showing the interior form. He found the most telling view by photographing the structure back lit very early in the morning, just as the sun had come up. Stoller’s entire archive of Wright’s buildings similarly reflects the photographer’s keen Modernist sensibility and careful attention to vantage point, lighting conditions, line, color and texture. Stoller documented these cultural treasures the way Wright preferred them to be seen, experienced and remembered. Ezra Stoller Photographs Frank Lloyd Wright Architecture will be on view during the Museum of Modern Art’s exhibition, Frank Lloyd Wright at 150: Unpacking the Archive (June 12 - October 1) and the Guggenheim Museum’s birthday celebration in honor of Wright on June 8. Ezra Stoller’s photographs have been exhibited internationally and are in numerous museum collections including the Museum of Modern Art, New York; Whitney Museum of American Art, New York; Museum of Fine Arts, Houston; High Museum of Art, Atlanta; Canadian Centre for Architecture, Montreal; and the San Francisco Museum of Modern Art. Stoller was born in Chicago in 1915 and graduated from New York University in 1938 with a degree in Industrial Design.